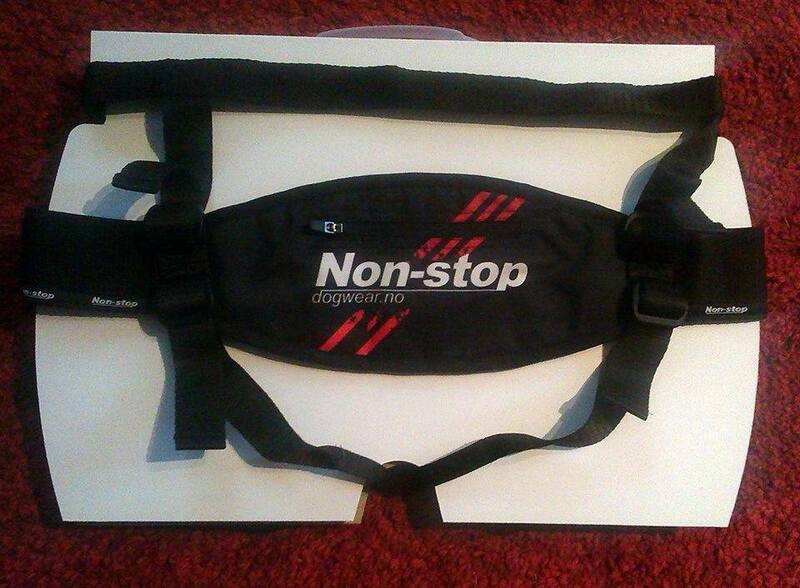 This short blog will highlight the features of the newest Non-stop waist belt – the Running Belt. It was designed over the summer of 2013 with many of Europes’ top canicrossers having had an input into how the waist belt was produced. The focus of the Non-stop Running Belt is to provide comfort for the runner by distributing the force of the pull across the largest surface area in the lower region of the body, the glutes. The main band of the belt which sits over the buttocks incorporates a small, handy pocket which can be used for storing poo bags or keys and can be adjusted to sit higher or lower by straps which are attached to the waist belt. The waist belt (which actually sits on your hips) is also adjustable and clips together at the front of the belt, behind the webbing strap where the ring to attach your dogs’ line to can be found. 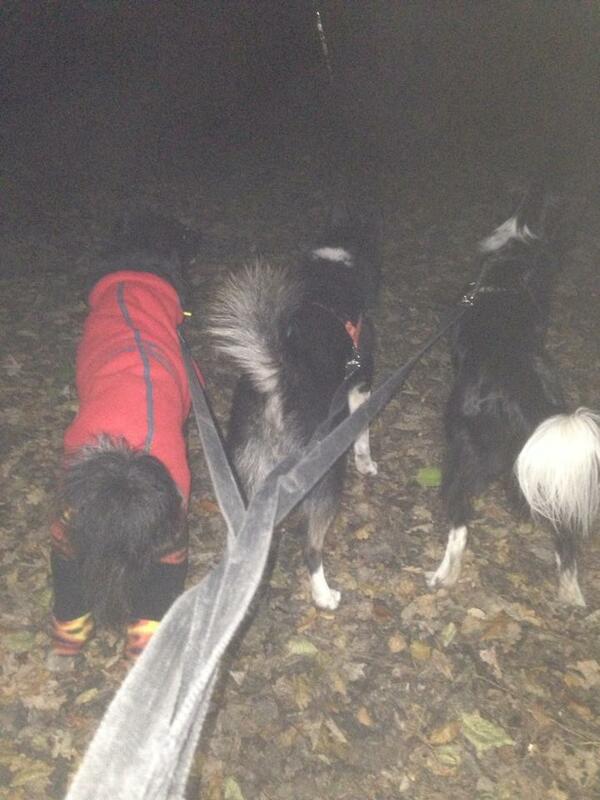 The use of a ring at the front of the belt prevents you being catapulted around sharp corners by your dog, as the ring slides along the webbing and allows you more time to follow your dog around any bends in the trail. The leg straps on the Non-stop Running Belt can be altered to make them as loose as you require but they are an integral part of the belts’ design and help keep the belt working as it should. 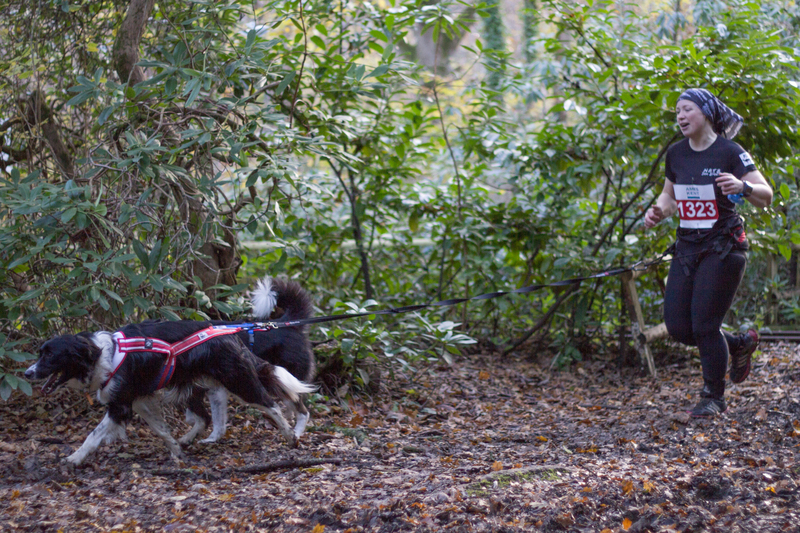 It is worth noting that because this belt is so adjustable it can take a few attempts to get it sitting perfectly for your own requirements but once you’ve got it correct, the belt directs all the pulling force from your dog with your forward movement and away from your back, making this an extremely comfortable canicross belt to wear. 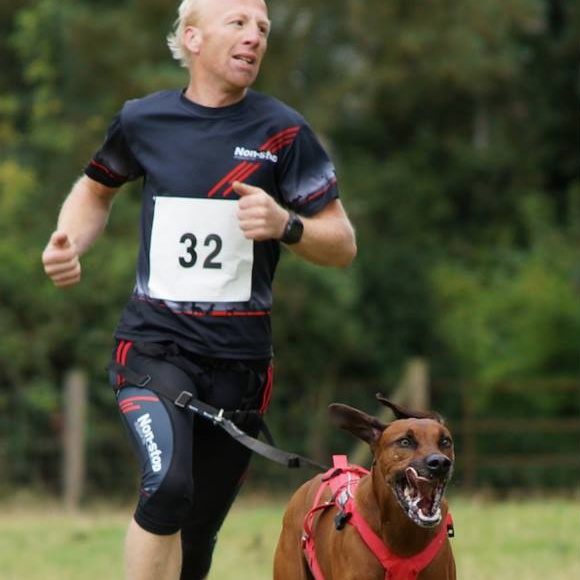 The Non-stop Running Belt was primarily designed for canicross racing but is just as suitable for training and is now being used by a number of recreational canicrossers. The belt also meets all International canicross race requirements, so you can be safe in the knowledge this belt is of the highest quality and design. I have been trialling the belt now for a few months and have found once you get the different sections of it adjusted, its’ unique composition makes it the most exciting new canicross product out of Europe this year. 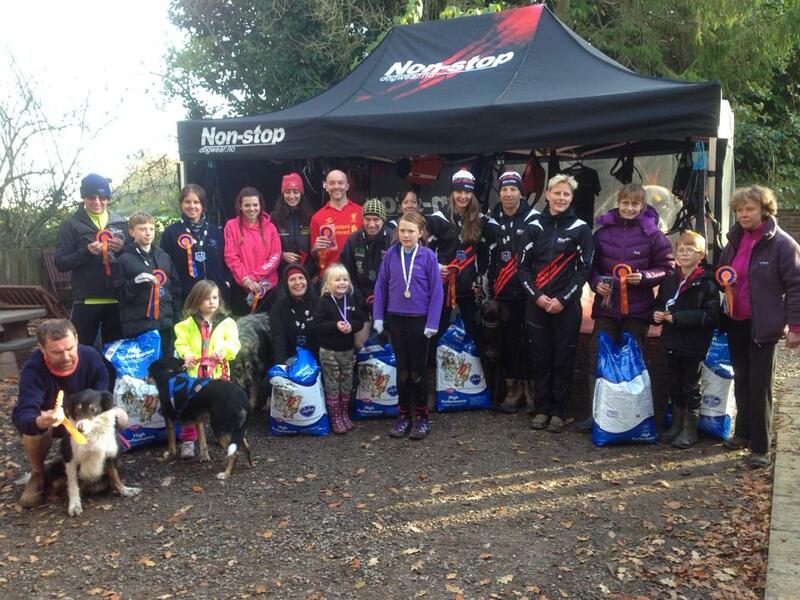 The Brokerswood Blast charity canicross race took place over the weekend of the 30th November and 1st December, with the Saturday being devoted to the Canicross race and Sunday for the Team Challenge, which I unfortunately could not stay around for but K9 Trail Time sponsored some of the prizes. The event was set in the grounds of Brokerswood Country Park in Wiltshire, a stones throw from Longleat Safari Park and not too far for us to travel to. We arrived in the late afternoon to set up in the caravan park, which is located just next to the woods and all enclosed on the private land. The facilities on site are fantastic with a very warm, clean toilet and shower block and even a little cafe! Saturday morning brought the start of the racing and all competitors were divided into two waves with an hour between them, allowing enough time for one complete wave to finish before the second went out. I was in the second wave and we were instructed at the briefing to choose a starting position based on our knowledge of our 5km times and what our dogs’ requirements were (i.e nervous dogs or beginners could start at the back). The slightly uphill start chute was wide and allowed a bit of time for the dogs to burn off some energy before looping around and bringing you up towards the start, passed the country parks’ lake, and then on around through the woods. The majority of the trail was undulating but not hilly and there were sections of twisty single track which the dogs loved. There were also two railway crossings to negotiate but only tracks for the little tourist train which had been stored away for the winter thankfully! The course went to the edge of the woods, where a strategically placed marshal directed you either back on another loop towards the start and round the lake again, or back down the finish chute which was also the start. Although the course wasn’t hilly, I still found it quite challenging with lots of tree roots, mud and natural obstacles to keep both myself and the dogs occupied with. I finished the 5km course in about 32 minutes which is probably all I could expect at the moment but still felt like I could have done better, so I was a bit disappointed with myself. When I’m competing I sometimes forget that my dogs don’t care where we get placed, they just enjoy the race and that’s all that matters to them. I actually still don’t know where I was placed in the two dog female category but many of my friends were placed and again the rest of the NATB Dog Sports team did very well, taking a number of places at the prize giving. I am sad that I missed the Team Challenge on the Sunday because there was great feedback from it, with people posting photos of themselves in boats on the lake, climbing trees and even taking part in archery. It will be one to watch for next year, as I believe the event will take place again in 2014 (keep an eye on the website for more details: http://www.cck9.moonfruit.com/) The event was very well organised with every detail catered for, including a childrens’ race which took part after the main racing, so no one was left out. I’d highly recommend this event to both beginner canicrossers and experienced canicrossers alike, (we even had European and World Champion canicrossers running in the event) everyone who attended remarked on the fun and friendly atmosphere. The event even managed to raise over £1000 for the charity ‘Cyclists Fighting Cancer’ (http://www.cyclistsfc.org.uk/) through the race entries, a raffle and proceeds of photos taken by Vicky Stipetic of Houndscape Photography (https://www.facebook.com/houndscapephotography). A fantastic weekend for a great cause. 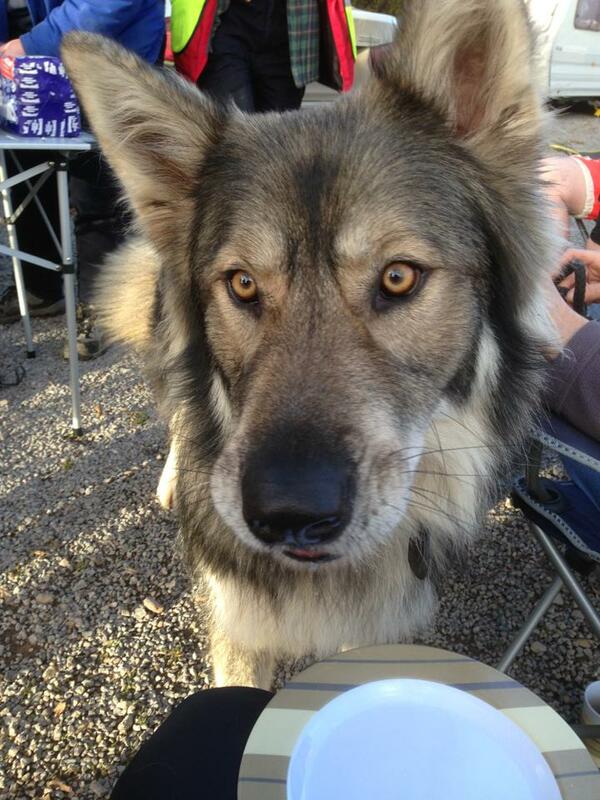 The highlight of the weekend for Monty was the bacon butties prepared by some of the canicrossers in their vans!